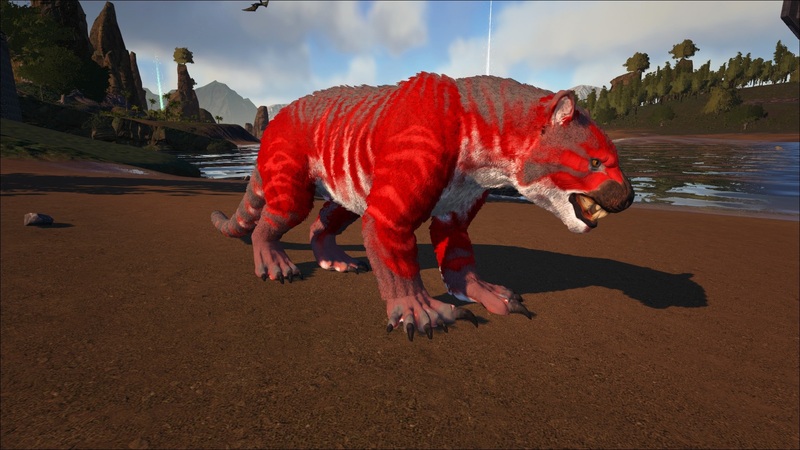 Thylacoleo often hides high in the redwood trees, faced down towards its prey. 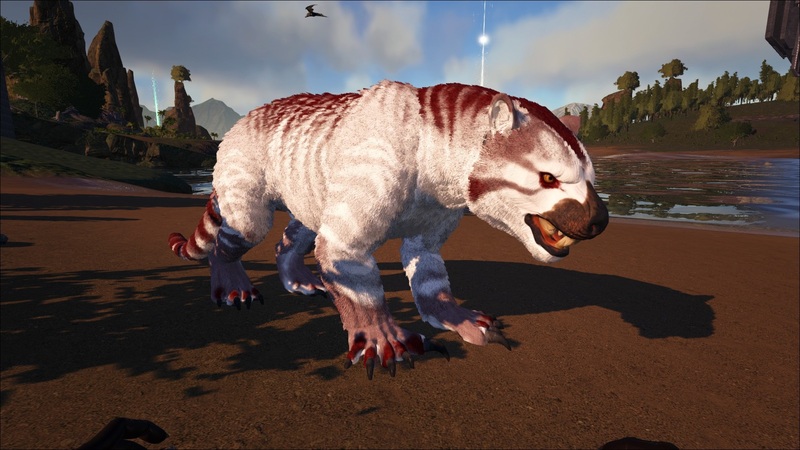 Upon entering aggro range, the Thylacoleo will leap from above, pinning any prey beneath its weight, even knocking players off of any mount. В этом разделе отображаются естественные цвета и регионы, которые имеет Сумчатый Лев.Для демонстрации, Сумчатый Лев имеет белый окрас (альбинос), а его регионы окрашены в красный цвет. Цветные квадраты, показанные под описанием каждого региона, являются цветами, в которые Сумчатый Лев будет случайным образом окрашиваться, чтобы обеспечить общий диапазон его естественной цветовой схемы. Наведите курсор на цвет, чтобы отобразить его имя и идентификатор. Например, "cheat SetTargetDinoColor 0 6" покрасит Сумчатый Лев "body" фиолетовый. Thylacoleo seems to always be aggressive . If on the ground it will pursue the player only when really close. Its aggro range seems to be similar to the therizino's. While clinging to the wall, the player can not use mounted weaponry. The Thylacoleo can cling to the wall indefinitely, and will stay attached even if the player dismounts (although it can be brought back down with a whistle command). While mounted and attached to the wall, if the player rotates the camera down, the Thylacoleo will flip over and a targeting reticle will appear, indicating that the Thylacoleo is ready to pounce with the attack key (default lmb). 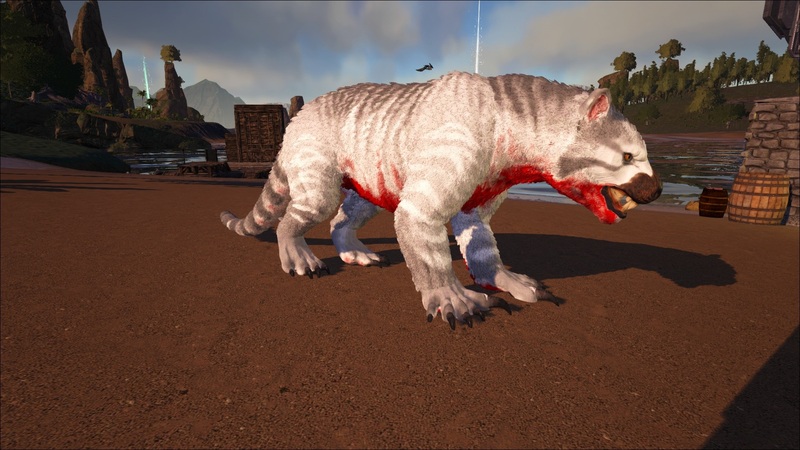 If the pounce hits a valid target (listed below), it will immobilize them and the Thylacoleo will chew on them until the target dies or the player releases it with the secondary attack key (default rmb). The pounced target is unable to fight back, although the pounce itself may incur some fall damage. Эта страница последний раз была отредактирована 30 января 2019 в 09:22.